Exercise induced heat illness is a serious, and at times fatal, health risk facing athletes who train or compete during warmer times of the year. It is the third leading cause of death among high school athletes in the United States. It is a condition that manifests when the body's thermoregulatory systems are unable to properly maintain its core temperature, causing it to rise to levels that can produce physical and mental symptoms, organ tissue damage and death. As such, it is wise to be aware of this condition and to take proper steps to recognize and more importantly to prevent its occurrence. 1. Heat Cramps: Muscle cramps associated with exercise during hot weather are characterized by involuntary and often painful twitching or spasm of skeletal muscles. Common areas affected are the abdomen, arms and legs. This is usually caused by a loss of too much sodium during a bout of exercise. Athletes with a high sweat rate or those who find a salty residue on their skin or clothing after exercise are at a higher risk.An athlete suffering from heat cramps should be observed for other signs of heat illness. 2. Heat Syncope: Commonly known as "fainting"; Orthostatic Syncopal Episode is another form of heat illness. It is typically seen after "maximal-effort" exercise bouts while exposed to hot temperatures. This results in maximal dilation of the blood vessels supplying the skeletal muscles and subsequently a reduction of blood flow to the brain. Athletes who are not properly hydrated and those who do not go through a proper cool-down period after exercising are at a higher risk. 3. 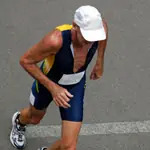 Heat Exhaustion: Technically known as Exertional Hyperthermia, heat exhaustion is a state in which the athlete is unable to continue exercising in the heat. Losing large amounts of fluids and electrolytes (as is a common denominator in all heat-related illnesses) while performing strenuous physical activity in hot temperatures is the predisposing factor. It is divided into two categories: water-depletion (usually seen during a single bout of strenuous exercise in the heat) and salt-depletion. Typical symptoms include nausea, vomiting, headache, hyperventilation, hypotension and elevated heart rate accompanied by profuse sweating. If untreated, this stage can lead to circulatory collapse and heat stroke. 4. Heat Stroke: This is a true medical emergency and should be dealt with accordingly. The diagnosis is made when the body's core temperature (this is taken rectally) rises above 104.9 degrees Fahrenheit. Typical symptoms include hot dry skin (although, not always), altered mental state (confused or irritable), lack of muscle control, vomiting, diarrhea, increased heart rate, hypotension, seizures and coma. The amount of damage and risk depends upon how high the core temperature reaches and how long it stays there. Prevention of heat related illness begins with proper hydration, training, acclimatization and awareness of ambient temperature. Just as any other aspect of training, heat acclimatization follows the SAID (Specific Adaptation to Imposed Demand). For a trained athlete it typically takes a minimum of two weeks of training in hot temperatures for their body to learn how to properly regulate its temperature variances imposed by hot weather. For an untrained individual, or in highly humid weather, this period may take as long as two to three months.